I’ve been doing a fair amount of hammock camping lately. I’ve also been studying and testing gear and techniques associated with making hammock camping more comfortable and convenient. I’m currently reading The Ultimate Hang: An Illustrated Guide to Hammock Camping by Derek Hansen. I’m hoping to see Derek at a seminar he will be giving at the local REI about hammock camping and, I’m sure, promoting his new book. Aside from the technical information about knots, gear, quilts, tarps, etc. Derek also discusses the history of the hammock in Western Culture. Most interestingly, he does discuss the importance hammock camping plays in protecting the environment. In my interview with Seth Haber of Trek Light Gear, he also touches on the fact that hammock camping is, by it’s nature, a zero-footprint way of camping. It is very closely associated with the Leave No Trace school of thought. To illustrate this point, I took a couple of photos this weekend while I was out camping with some friends. 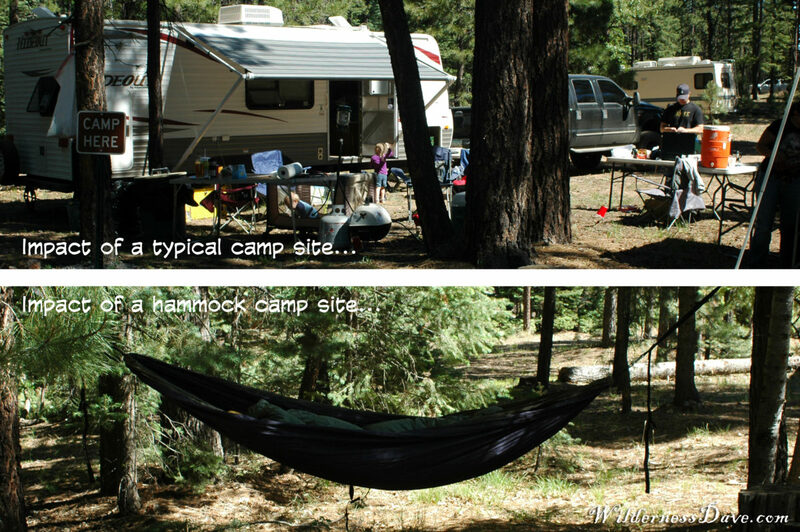 This photo is not to place judgement or to show that one method is better than the other, simply to show the difference in the impact (footprint) of a typical family camp site vs. the impact of a hammock camp site. Whether your style of camping is closer to the top, or the bottom picture…whatever gets you and your family outdoors enjoying nature is good enough! The sad side of this weekend was something I failed to get any pictures of. Just a couple of camp sites down from where we were, a previous party had left a giant pile of trash and debris. It looked almost as if they had brought trash from home just to dump at the camp site. It was frustrating and infuriating to witness. Back in Northern California, in the more rural areas, we would find trash dump sites all throughout the forests. People would use the wilderness as their personal landfill to avoid having to pay to dump in the actual landfill. Often these sites would host appliances riddled with bullet holes and broken down vehicles with rusty frames and the engines missing. I think it’s that sort of carelessness that I’ve seen in the backcountry that makes me so self-conscious about my own impact on the environment when I’m in the wilderness. On most local trails, I often return carrying trash I’ve collected from the trail. On camping and backpacking trips, I go to great lengths to make sure I’m leaving things just as I found it. My time camping along the Colorado River it was a constant challenge to leave our camp site cleaner than it was when we arrived. What are your “camp rules” for making sure you leave a clean camp site? Have you ever tried camping in a hammock? Would you take an extended trip camping in a hammock?